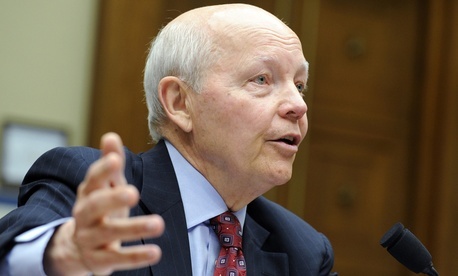 Internal Revenue Service Commissioner John Koskinen on Wednesday responded for the first time to assertions by a legal nonprofit that missing emails relating to the political targeting controversy at the tax agency exist on a governmentwide backup system. His conclusion: There is no such governmentwide email trove, and confusing media accounts were based on a misunderstanding. Neither the Justice Department nor the IRS responded to August inquiries from Government Executive. In prepared testimony, Koskinen summarized steps the IRS has taken both to screen and deliver documents demanded by Congress and to improve internal email management. The agency has handed over more than 1 million pages of unredacted documents to the tax-writing committees and more than 810,000 pages of redacted documents to the House Oversight panel and Senate Permanent Subcommittee on Investigations, including 67,000 related to Lerner, he said. Lerner’s BlackBerry, he explained, “was replaced in February 2012 with a newer model as part of an ongoing BlackBerry update involving approximately 5,000 IRS employees. Because Ms. Lerner’s old BlackBerry was obsolete, it was disposed of under standard IRS recycling procedures. As for the replacement BlackBerry that was issued to Ms. Lerner in February 2012, it currently is in possession” of the Treasury Inspector General for Tax Administration. Top management emails will be turned over to the National Archives and Records Administration as permanent records. Senior executive emails will be preserved for 15 years, and those of other employees seven years. Employees have also been given guidance on avoiding the use of personal email accounts for official business. Judicial Watch, meanwhile, on Sept. 17 filed a motion for a right to discovery and an oral argument in its case seeking documents from the IRS on how lost or destroyed records relating to the targeting of conservative groups can be retrieved.